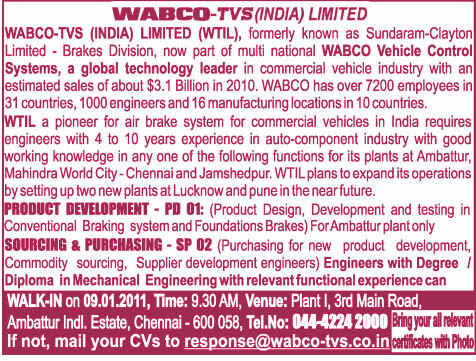 WABCO-TVS (INDIA) LIMITED (WTIL), formerly known as Sundaram-Clayton Limited - Brakes Division, now part of multi national WABCO Vehicle Control Systems, a global technology leader in commercial vehicle industry with an estimated sales of about $3.1 Billion in 2010. WABCO has over 7200 employees in 31 countries, 1000 engineers and 16 manufacturing locations in 10 countries. 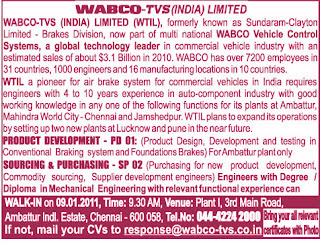 Engineers with 4 to 10 years experience in auto-component industry with good working knowledge in any one of the following functions for its plants at Ambattur, Mahindra World City - Chennai and Jamshedpur WTIL plans to expand its operations by setting up two new plants at Lucknow and pune in the near future.